Another storm system will dump more snow on the Finger Lakes, making for difficult travel Monday morning. After a storm system Saturday night dumped several inches of snow and then blew it all over the place with strong winds, the Finger Lakes has hardly had time to catch its breath before a second storm marches in. Winter Storm Warnings are up for the western Finger Lakes, while the remainder of the region is under Winter Weather Advisories. Snow is already moving through southern Ontario this afternoon and will start to push into the western New York and the Finger Lakes as the afternoon transitions to the evening. Snow will persist through the night and into Monday morning. Some of the snow may be heavy at times, and road conditions Monday morning may be treacherous. Temperatures during the heaviest precipitation will be warmer further east, and a little rain may even mix in across the eastern Finger Lakes Monday morning. In these areas, snow accumulations will be a bit less, with generally 2 to 5 inches falling. Some of the higher elevations could exceed that amount, though. Further west, temperatures will be a bit colder and some enhancement from Lake Huron, east of Michigan, may help boost snow totals slightly. In these areas, 4 to as much as 8 inches may fall. 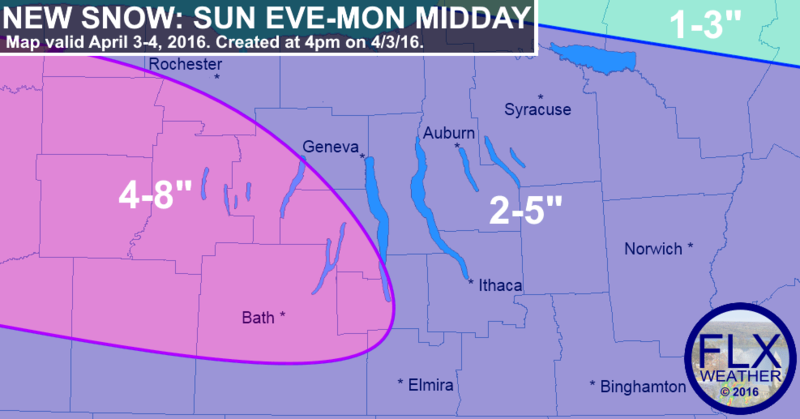 The best chances for over a half foot will be in the higher elevations and near and just north of Buffalo. Precipitation will move out by the middle of the day on Monday. Thankfully, winds with and after this system will not be as strong. However, clearing skies Monday night and Tuesday night will send temperatures plummeting into the teens and even single digits Tuesday and Wednesday morning.